A ceremony has been held in Clydebank to mark the centenary of the launch of one of Britain's largest warships. The battlecruiser HMS Hood was launched at John Brown's shipyard in Clydebank on 22 August 1918. Until the commissioning of the new aircraft carrier HMS Queen Elizabeth, there had never been a bigger British warship than "The Mighty Hood". The ship was sunk in 1941 by the German battleship Bismarck, with the loss of all but three of the 1,418 crew. The laying of the keel for HMS Hood got under way at John Brown Shipyard in Clydebank on 1 September 1916 and it was launched two years later just before the end of World War One. Lady Hood launched Hood in 1918 in memory of her late husband Rear Admiral Sir Horace Hood, who was killed in his ship, HMS Invincible, at the Battle of Jutland on 31 May 1916. Hood was the final battlecruiser built for the Royal Navy. 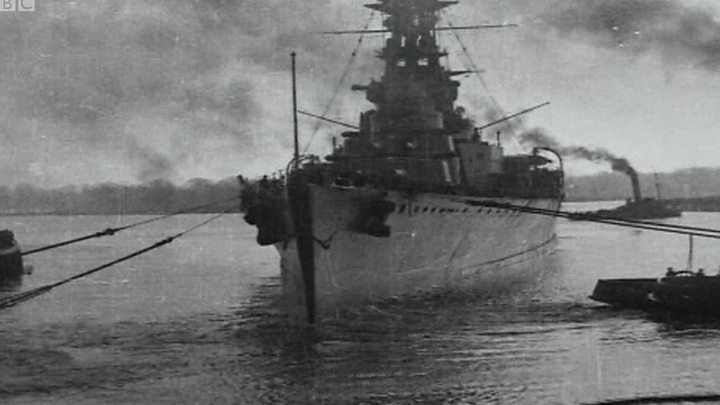 Battlecruisers were similar in size and offensive capability to battleships but usually carried less armour so they could reach higher speeds. The ship was equipped with eight 15in guns and was capable of 32 knots. HMS Hood was revered as the most powerful warship in the world for more than 20 years, earning the nickname "The Mighty Hood". But in May 1941 - during the battle of the Denmark Strait in the North Atlantic - it was sunk by the German battleship Bismarck. The British and German ships were separated by about 10 miles of sea but the Bismarck soon found its target. The Bismarck was probably the most powerful warship in commission at the time and the Hood was a battle cruiser, rather than a battleship. This meant it had less armour than a battleship, particularly horizontal armour against plunging fire - shells coming down from on high at a long range. HMS Hood was struck by several German shells near its ammunition magazines which subsequently exploded, causing the ship to sink. It sparked a huge Royal Navy pursuit of the Bismarck, which was destroyed three days later. More than 2,000 German sailors lost their lives. Rear Admiral Philip Wilcocks, the president of the HMS Hood Association, told BBC Radio's Good Morning Scotland: "Hood was the largest ship in the Royal Navy until our two new aircraft carriers. "She was, in the inter-war years, the iconic figure for the Royal Navy, for the country, and in those days, for the Empire." Rear Admiral Wilcocks said the John Brown yard in Clydebank was accustomed to building big ships but when Hood was launched it was the biggest ever in the UK. He said Hood spent most of her time patrolling around the UK or in the Mediterranean. "But in 1923 she went around the world with the Special Service Squadron," he said. "She went to South Africa, Sri Lanka, Malaysia, Singapore, New Zealand, back across the Pacific to the United States. "At that stage she was one of the largest ships to go through the Panama Canal. "She ended up in Canada and then came on back. She was nearly a year steaming around the world." Rear Admiral Wilcocks said the sinking was a tragedy, leading to one of the largest losses of life for the Royal Navy. "It was the equivalent of three battalions of troops lost in three minutes," he said. "My uncle, my father's youngest brother, was killed on board. "My grandmother was devastated by the loss but she was just one of the many who had to come to terms with the loss of so many people."